HOPKINTON — Tens of thousands of runners streamed down the Boston Marathon course under brilliant skies today, while spectators grew hoarse cheering them on, in an old race with a profound new message of rebirth after last year’s deadly terror bomb attack. The race did rebound — in a big way. More than 35,000 runners participated today in the 118th running of the race, including thousands who were prevented from finishing last year when the bombs went off, bomb survivors whose wounds have healed, and people running in the memory of those who died. In some ways, it seemed like a typical Boston Marathon, normally a colorful spectacle that coincides with a Red Sox game and a Patriots Day reenactment of the Revolutionary War Battle of Lexington. The men’s elite race was won dramatically by Meb Keflizhigi, the first American to win the race since 1983. The women’s race was won by Kenyan Rita Jeptoo, but Shalane Flanagan of Marblehead led for the first 18 miles before flagging and finishing seventh. After the elite runners swept across the finish line, wave after wave followed of the less-fleet but equally determined. In other ways, things were different. Security was tight — and the attack was not far from many people’s minds. Some were anxious. But many were defiant and determined not to let the attack change their enjoyment of a rite of spring in Boston. And observers said the crowds this year, armed with thousands of “Boston Strong” T-shirts and placards, seemed especially fervent and vociferous in encouraging the runners. Hopkinton native Matt Ellam said he had been to the starting line 16 times, but he decided to run the race a day after the bombings. Meg Gibson was on hand near the starting line to cheer her fiancé, Steve Paullin, who is hoping to post a personal best of 2 hours and 50 minutes today. Paullin ran last year, crossing the finish line before the bombs exploded. Law enforcement officials said that stepped-up security meant there was nothing to fear. 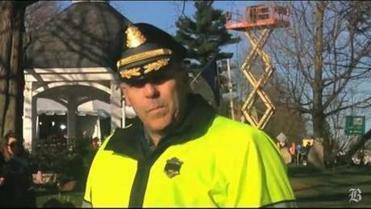 State Police Colonel Timothy Alben said the marathon represented the culmination of months of security planning, but that law enforcement also wanted the race to retain its friendly atmosphere. “This always has been a great celebration, a great holiday in this state. The last thing we want to do is temper that great feeling,” he said. In what was expected to be a common occurrence, first responders rushed to the Public Garden in Boston at 7:30 a.m. to investigate an “orange backpack left unattended.’’ Law enforcement officials left after finding nothing. At 8:45 a.m., a moment of “reflection and remembrance’’ was held at the starting line, honoring the victims of the bombing and the two Boston firefighters and Boston police officer who died in the line of duty this year. Shortly after 3:30 p.m., Boston EMS said seven patients had been transported to area hospitals from one medical tent. Late this afternoon, Officer James Kenneally, a Boston police spokesman, said one person had been arrested for disorderly conduct. “Everybody was well-behaved,” he said. Many athletes and spectators were fiercely determined to come to the race. Bill Foreman, a disabled Vietnam vet, drove from Roanoke, Va., overnight so he could walk the route — on his artificial knee. Foreman said he left Roanoke around noon Sunday and arrived in Boston around 2 a.m. today, renting a room at the Liberty Hotel. From there, he took a taxi cab to Hopkinton this morning, a trip that cost him $100. He said he was driven by the same sense of patriotism that compelled him to go to New York City after the Sept. 11, 2001, terror attack. A wisecracking veteran of two tours of duty in Vietnam, a conflict that his four brothers also served in, Foreman said he was also motivated to participate when he read that the women of Wellesley College help runners as they pass. At the other end of the marathon route, on Boylston Street in Boston, the Poitras family of Dracut had staked out a spot on the finish line at 7:30 a.m. They expected to spend the rest of the day there. The bombing moved all of them. Andrew joined the Army National Guard six weeks later and Nicholas decided to become an EMT – he graduates next month. Standing just feet from where the first bomb went off, Andrew said he was reminded of why he serves. “It makes me want to give back,’’ he said. Lucas Carr of South Boston was emotional after finishing the race. The runners included a team of 102 people running in the memory of Martin Richard of Dorchester, who was 8 years old when he was killed. The twin bombings were allegedly carried out by brothers Dzhokhar and Tamerlan Tsarnaev. Tamerlan Tsarnaev, 26, was killed in a shootout with police in Watertown. Dzhokhar Tsarnaev, now 20, is currently being held without bail and has pleaded not guilty to all charges in federal court. Prosecutors are seeking the death penalty. Laura Crimaldi can be reached at laura.crimaldi@globe.com. Follow her on Twitter @lauracrimaldi.Eric Moskowitz can be reached at emoskowitz@globe.com.John R. Ellement can be reached at ellement@globe.com. Follow him on Twitter @JREbosglobe.